Happy Friday all! It's Thanksgiving here this weekend so I am particularly looking forward to a long weekend. Happy Thanksgiving, fellow Canadians! 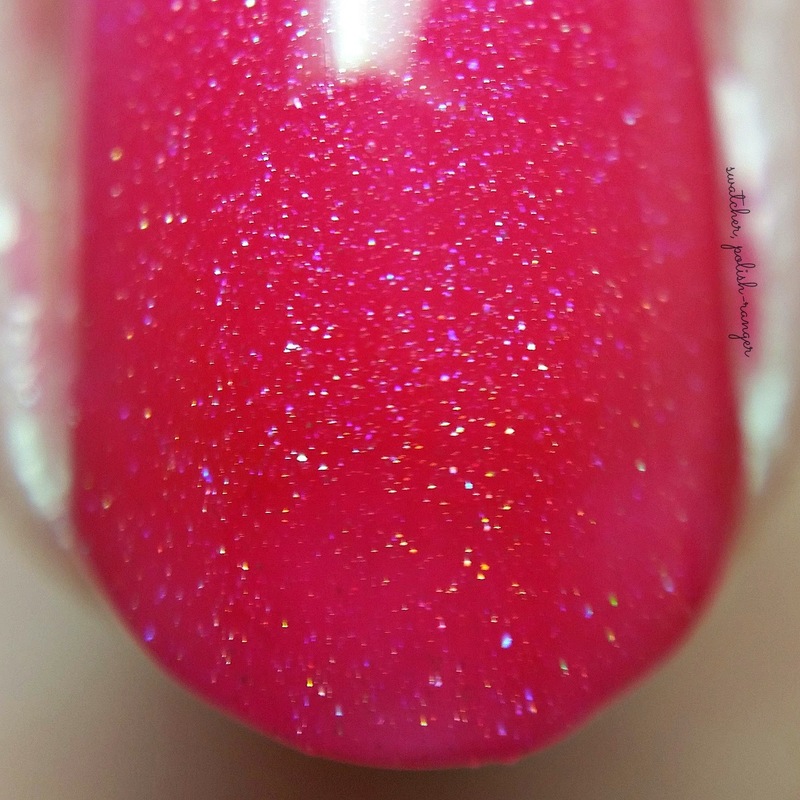 Today I have part one of the Fall for FLL collection from Finger Lickin' Lacquer. These arrived on my doorstep at the perfect time - the weather is cooling down, the sweaters are coming out of storage, and I'm looking forward to ALL THE PIE! A note on the formula - these are all on the thinner side so, depending on your preference and how thick your coats are, you may need three or four coats to build opacity. I was able to get away with two coats for most of them but I do use thicker coats. 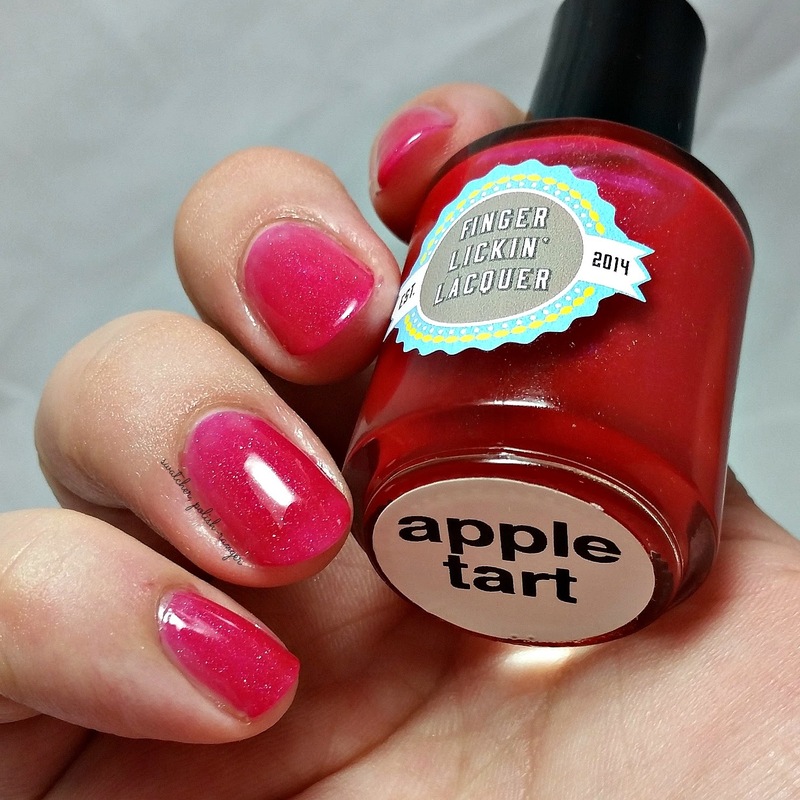 Apple Tart is a bright red scattered holographic polish that brings to mind chilly nights at the carnival with candied apples, or brisk fall days spent up at the local apple orchard picking apples and stopping in for some warm apple cider and maybe an apple cider doughnut too. It is scented with an apple tart fragrance. I LOVE this one. It is so reminiscent of bright red Macintosh apples and the jelly formula is wonderfully squishy. The scent is understated and lovely and is just perfect. 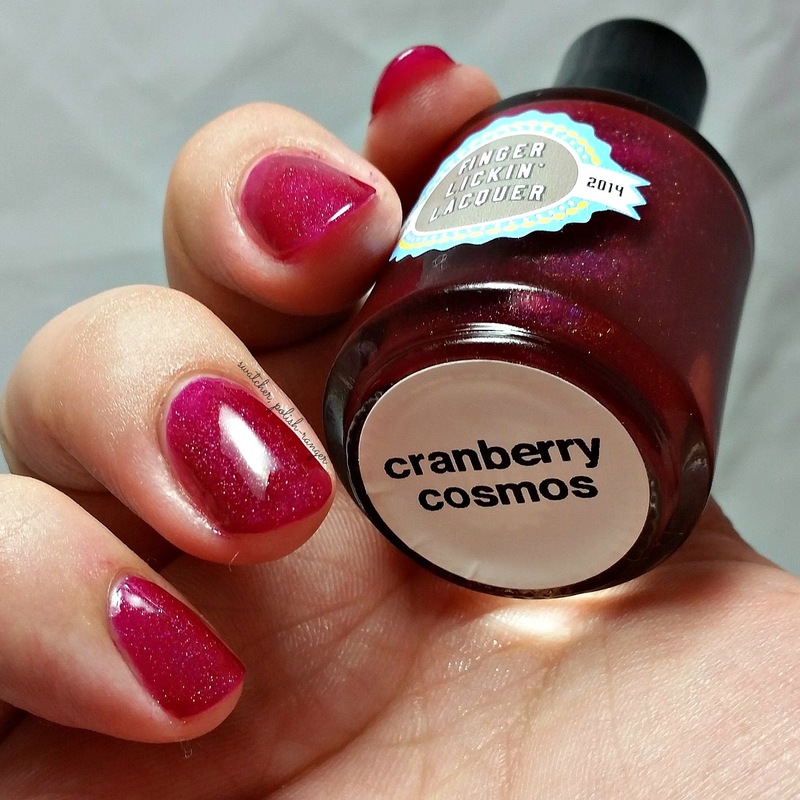 Cranberry Cosmo is a cranberry intensely holographic polish with the sweet and tart fragrance of cranberry relish. This polish has all of the sparkle and shimmer of the cosmos packed into a beautiful cranberry red that is perfect for Thanksgiving dinner. I have to say, I'm really digging the reds this season (which is weird for me) and this is another amazing one. Again, the scent isn't overpowering and just adds a nice touch. Mauvelous, Dahling! is a mauve scattered holographic polish. 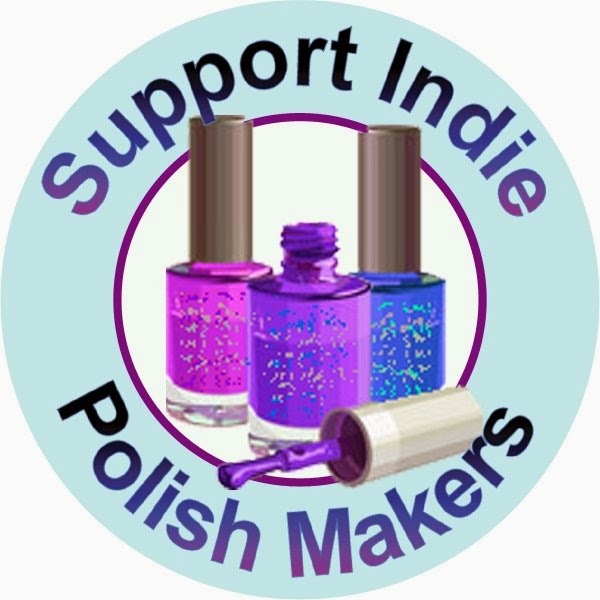 Mauve is a perfect fall color and goes well with everything, and the subtle holographic sparkle really makes the polish pop. Mauvelous, Dahling! is the third unscented polish in the fall collection. I mentioned this in episode six of Nail Newscast (promo!) but I think Jennifer did a fantastic job of making this a vampy fall colour. Mauve can easily fall in the "old lady" category but this polish is anything but stodgy. Pumking is an orange scattered holographic polish with hints of green shimmer. Pumking is the perfect pumpkin polish for fall. It’s perfect for trips to the pumpkin patch and for carving your spooky jack-o-lantern. Pumking is scented like sweet pumpkin pie. This may be a weird statement, but I feel like this a great "neutral" orange in that it would look good on many different skin tones. The subtle green tones keep it from being garish and the scent, again, is the perfect little something. I apologize for the little fuzzies - why do you never see those until the editing process? Gah! Have a great weekend! * This post is brought to you by eOne Films. If there's anyone who knows how to get the tears flowing, it's Nicholas Sparks. I will never forget the day I was riding the bus when I lived in Vancouver and the woman beside me was crying because she was reading "The Notebook;" I told her she's going to need a lot more tissue. Now, there is a new Nicholas Sparks movie coming soon and, if the trailer is anything to go by, The Best of Me is going to be another tearjerker. Based on the bestselling novel by acclaimed author Nicholas Sparks, The Best of Me tells the story of Dawson and Amanda, two former high school sweethearts who find themselves reunited after 20 years apart, when they return to their small town for the funeral of the beloved friend. Their bittersweet reunion reignites the love they've never forgotten, but soon they discover the forces that drove them apart twenty years ago live on, posing even more serious threats today. Spanning decades, this epic love story captures the enduring power of our first true love, and the wrenching choices we face when confronted with elusive second chances. 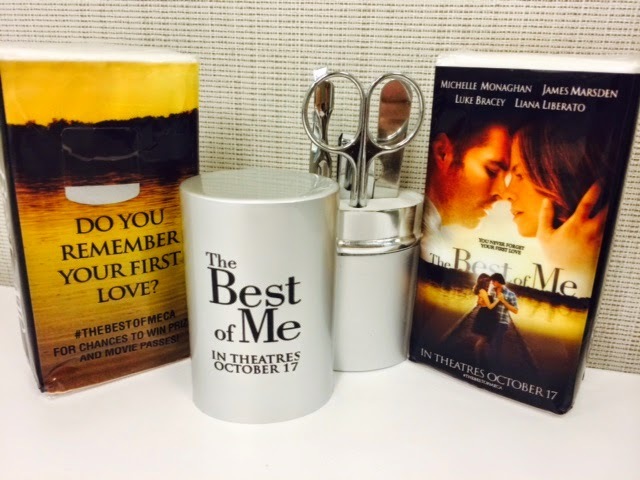 Starring Michelle Monaghan, James Marsden and Liana Liberato, The Best of Me is in theatres October 17th. BUT!! Ten (10) of my local readers can win the chance to attend an advance screening at Cineplex Odeon Eau Claire Market on Wednesday, October 15th, along with a prize pack of a manicure set and tissues (you'll need them)! Simply enter using Rafflecopter below (opens October 2nd at 12 AM) and you could be amongst the first people to see The Best of Me.